Improve park, neighborhood and street lighting with heavy-duty post lights in attractive styles. This selection of outdoor lamp post designs features a fixture for any setting. From classic neighborhood street lights, to fixtures for a commercial parking lot, find the right pole light online at Sign Bracket Store. Each post mount light is made from durable, commercial-grade materials rated for outdoor use. And post lights are also given powder coated finishes for superior rust resistance. Use outdoor lamp posts to line neighborhood sidewalks, pathways, and as functional street lighting for a safety boost. 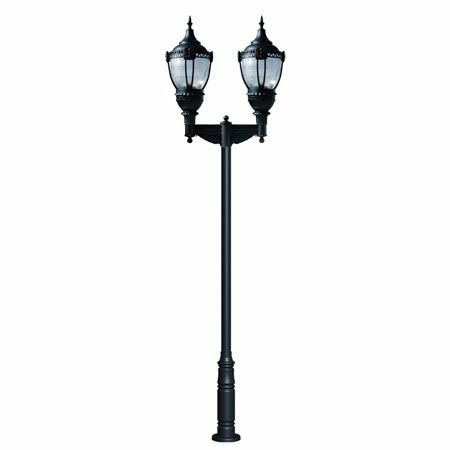 Styles include single and multi-fixture lamp posts with various finish options. Customers can also call for custom shade and arm combinations, sizes and upgraded lamping like high-intensity discharge post lights. Whatever the project, let us guide you to the right outdoor lamp post for the job. Find the right post mount light for city planning, commercial developments and neighborhood improvement - online at Sign Bracket Store. With a host of outdoor lamp post styles to choose from, this category of products satisfies a need for functional and attractive park lights, neighborhood lights and street lighting styles. From urban sidewalks, to a rural nature preserve, the right lamp post adds personality while increasing nighttime safety. Our assortment of post lights includes commercial-grade fixtures made from outdoor-rated materials and finishes. And with designs ranging from the classic carriage lamp style, to a French Quarter light post design, we've got street lighting covered from various aesthetic angles. Browse fixtures above and click on individual products for more details. Each heavy-duty pole light has a powder coated finish for polished, rust resistant performance. And for projects where street and neighborhood lighting calls for a custom hue, Architect Design Lighting offers a range of color options and matching by request (price increases may apply). Browse park and street light designs online to view our range of size and style options. In addition to the neighborhood street lights pictured, we also work on custom orders for unique shade and arm combinations, sizes and powder coat finish colors. Most pole light fixtures come with standard incandescent lamping. Other options include compact fluorescent (CF) post lights, or HID options including metal halide (MH) and high pressure sodium (HPS). If you see an outdoor lamp post and want to upgrade lamping please call toll free for details. Adding efficient street, neighborhood and park lights adds an instant boost to safety and personality. Illuminate sidewalks, pathways and private streets for increased visibility at night, and a sophisticated look during the day. Attractive and efficient outdoor post lights are a must for any city planning, commercial development or special improvement project.